Looking for recognition through self promotion, sharing and community education. EMS Week vs. Everyone Else Week. I went on a bit of a rant this week and was joined by Josh to keep me reined in a little. Have I gone wrong someplace, is it just me? Drop your comments below. I think also that their should be more recognized. It should be shown to the lay individuals what we do and we are not just ambulance drivers. We should be honored in our area. Enjoyed the pod cast. Jim, leadership of EMS is transitioning from physicians and nurses to paramedics. The transition is most apparent in EMS education where leadership is almost entirely advanced degree paramedics. As this transition takes place eventually events like EMS week will be led and sponsored by EMS organizations and not physician organizations. Passionate leadership for EMS will come from with EMS by paramedics just like you and Josh. Thanks Greg. This is true. I just wish more people would get on board and it would happen a bit faster. Horse crap. All of my management is composed of former field paramedics and they are as out of touch with what goes on in the field as any doctor I’ve ever met. In fact, many of them are less aware of what it going on than the EM physicians I work with every day. From what I’ve seen it takes about a week for them to forget what they used to know about EMS in the field. A college degree doesn’t make anyone smarter or a better manager, it just gives them credentials. If I had a nickel for every time I heard an EMT or Medic referred to as an “ambulance driver”, the fortune amassed would be divided among each and every “driver” that has, is, or plans to stand at Jim’s side till the forgotten providers – all those that try to ease pain, save loved ones and live worthy lives – are paid with respect. I know some people have a tough time with what the letters EMT, EMS ALS ACLS etc.actually stand for but when I hear the “D” word I want to throw a tantrum only a two year old could get away with. Jim, you have, for years, been a compassionate medic, a mentor bar-none, and so clearly an advocate for those with whom you share the trenches. It seems all we do is ask you for more. You are a big guy, but there are so many shoulders who should help carry this burden thus my first response (no pun…) Working in EMS, being the voice of those who stand with and make the difference between saving lives and accepting death, salute all you have done and the only gift to offer is the complement of asking – “say it again Jim.” I say a gift, not with a smile, but with deep sincerity. Rant and rave because your words, deeply felt yet probably hard to draw together, depict the dedicated and brave person you are. One day ( maybe like Bogart) as you “say it again” the doctors, nurses, administrators, civil service workers….The People, past present and future patients, will not only hear but will understand who we are. I still liked EMS week back in October until they changed it to May back in 1989 . Too close to Nurses week in May . It’s not mystery what we do. We pick people up and take them to the hospital. EMS has spent 30 years telling people that if there is any doubt in their mind they should call 9-1-1. We’ve succeeded all to well because they call us all the time. We haven’t been unsuccessful in getting our message out, we’ve been TOO successful in getting our message out. 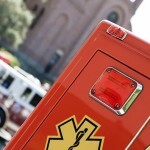 My employer reports that they can not afford EMS week for all 15 paid employees. They rely on what the hospitals give out during the day, and the boss makes an appearance away from his real paid firefighter job to burn hamburgers and hot dogs, for an hour on one day, on the grill that nobody has cleaned since it was bought.